Proper mulching benefits tree health by controlling soil temperature in extreme heat and cold, retaining moisture, reducing competition from grass roots, controlling weeds, and preventing lawn mower and string trimmer damage. However, improper mulching causes irreversible damage to a tree. When mulch is applied properly, only a very thin layer should be near the trunk of the tree. 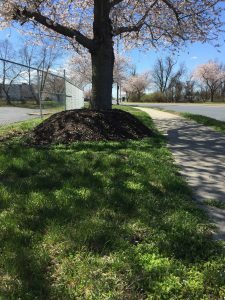 Mulch depth can then increase as the mulch ring extends away from the truck to a depth of about 2-3”, ideally to the drip line edge of the tree’s outer canopy. Excessive mulch depths at the trunk are more harmful than beneficial, as this can cause stem decay, root decay, and girdling roots. 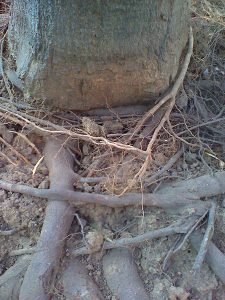 Girdling roots encircle the trunk, often growing above ground level, reducing the flow of nutrients to the tree. This can compromise establishment of a secure root system, leading to the tree’s premature decline and increasing the risk of tree failure. If you are having trees planted, or plan to mulch existing tree rings, make sure to avoid “mulch volcanoes” around your trees. If you have any questions or are looking for help with tree care, don’t hesitate to reach out to us!